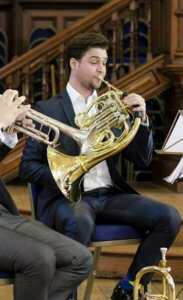 We are pleased to announce that Alex Wide has been appointed to the newly-created position of Co-Principal Horn. Alex has worked frequently with Britten Sinfonia over the past few years, and has also taken an active role in mentoring and coaching members of Britten Sinfonia Academy. You can next see Alex on stage with Britten Sinfonia during our Elder conducts Brahms concerts.